Local – Gifts, Books, etc. I’ve tried traditional mooncakes a couple of times, but did not like them either time. It is not to say I could not find a mooncake which I might love, but I haven’t wanted to buy and sample ones that I think I might end up spitting out. I decided to make a mooncake I would like. 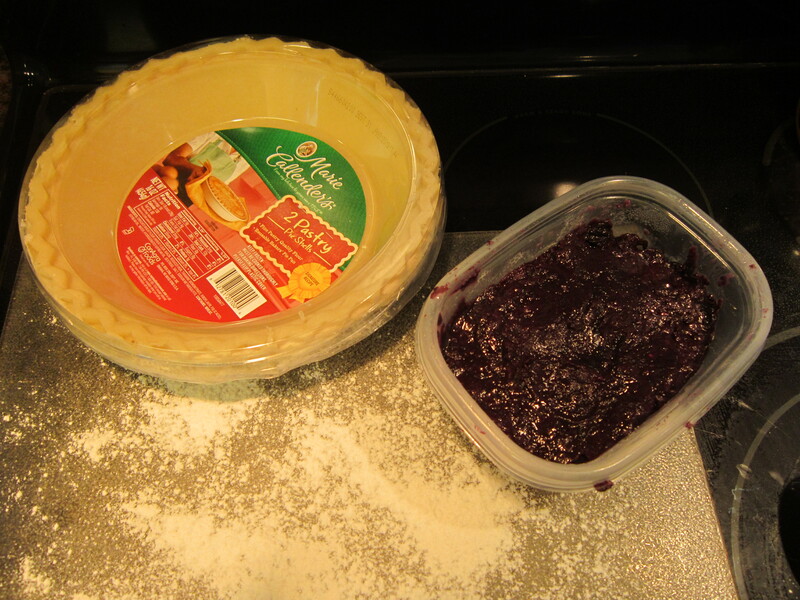 I like blueberry and cherry pie, so last year I thought I could make a blueberry tart in my mooncake press. I started with a can of blueberries which I added lots of flour, oatmeal, and some sugar and butter. It did not work out too well. I used the blueberry concoction as the filling and pie dough as the shell. There was too much pie crust to the blueberry filling. And because the filling was not dry enough, it just did not work out so well. I vowed I would try again. But from my attempt last year, I did realize that in the end I would not have a blueberry tart, but more like a blueberry PopTart. I’m OK with that, as I like blueberry PopTarts (no icing). So I have watched a lot of YouTube videos about making mooncakes to help me adapt my ingredients to work like a mooncake is supposed to and to use with a mooncake mold. What I created this year is not perfect, but it is a major improvement. I stirred this up and cooked it a little more. Then I put it in a container and put it in the fridge and let it cool for a day or two. (in retrospect, I might add a teaspoon of lemon juice next time, and maybe a little more sugar). I bought pie dough to use as the outside of the mooncake. I would have preferred to use the fresh pie dough, but only found it made with lard. I prefer not to use lard in making my mooncake. 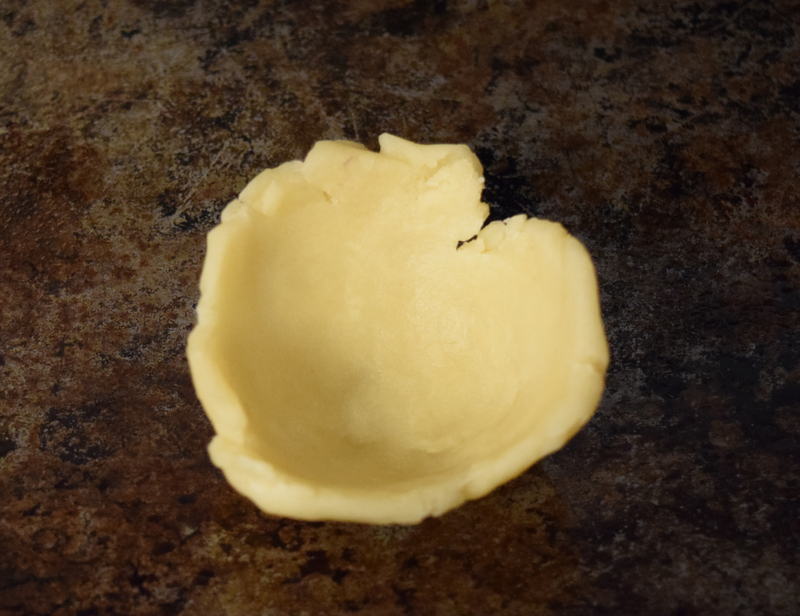 I ended up with frozen pie crust, which I cut up and thawed out. In those YouTube videos about how to make traditional Chinese mooncakes, the bakers were always weighing out the filling and the crust. So I decided to weigh out my filling and do different weights and try different combinations. I tried the following weights of filling: 15 grams, 23 grams, 27 grams and 30 grams. I rolled the balls of blueberry reduction into little balls. Then I rolled them in a little flour and set them aside while I worked with the pie dough. I didn’t really weigh out the pie dough. 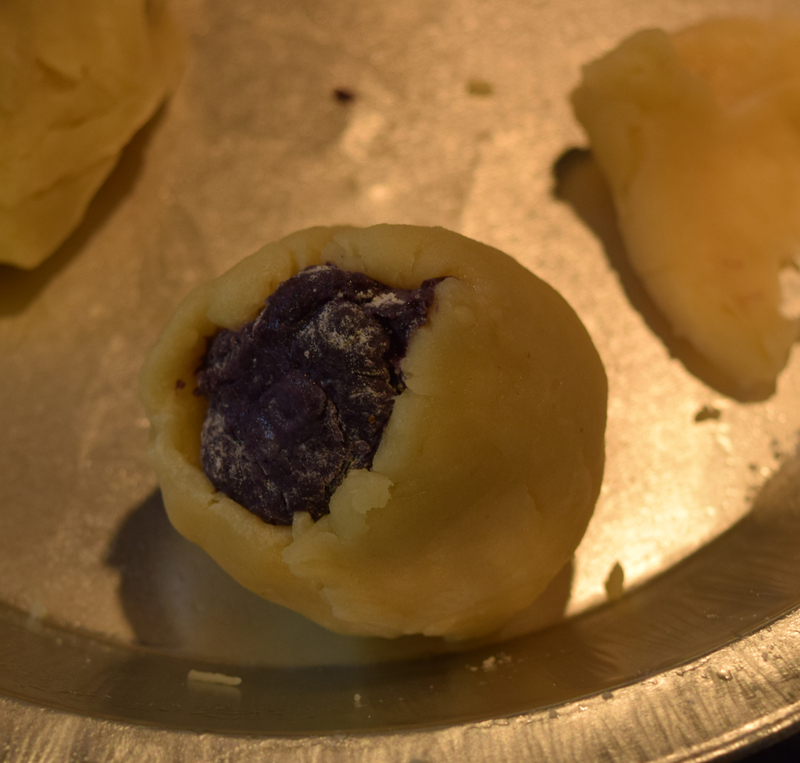 For the first two mooncakes, I attempted to created a pocket by mashing the pie dough around the ball. The last two (which worked better), I balled up the pie dough and created a little cup which I put the blueberry ball into. 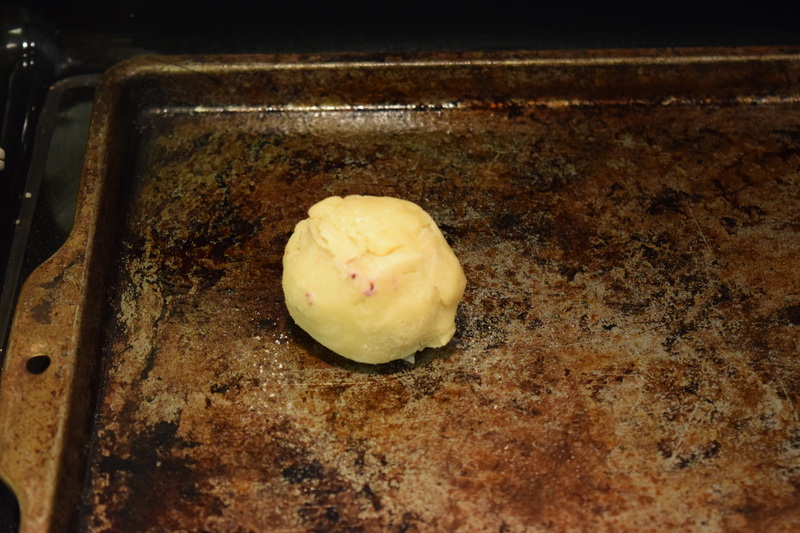 Then I mashed the dough around the ball. Obviously I’m not a baker and don’t know what I’m doing. I’ve never made pie dough, which is why I bought it frozen. 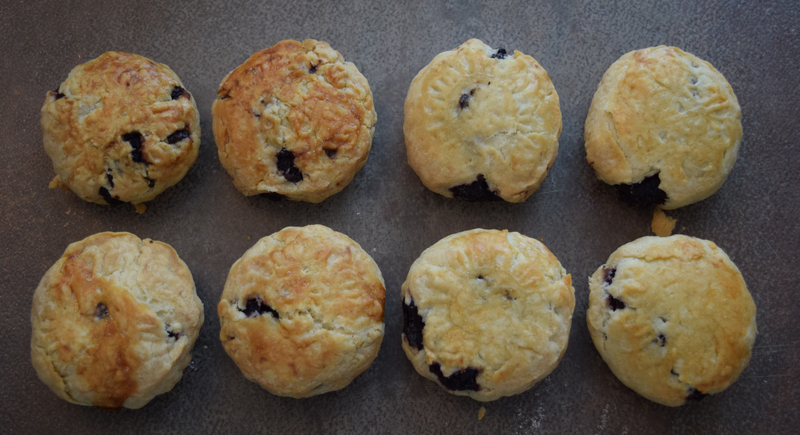 I baked the first four and decided I liked the 30 grams of blueberry reduction better than the other weights. Fifteen grams was sort of like a real PopTart, but maybe too much pie crust. I made the rest of the reduction into little blueberry balls (30-31 grams) and put them back in the fridge while I worked on the crust. Another thing I learned on the YouTube videos was the bakers called for working with filling and crust at room temperature. But for mine, I needed to keep the filling in the fridge, probably because it wasn’t quite dry enough to stay at room temperature. This is what my ball looked like before I put it into my mooncake press. According to the videos, you put the side of the mooncake that has the closure face up to the impression is put into the place most likely to fall apart. The videos did not say why, I’m just guessing. I got my mooncake molds off of Amazon, there are many places to buy them. I have the 2.5 inch molds which came with four different designs. 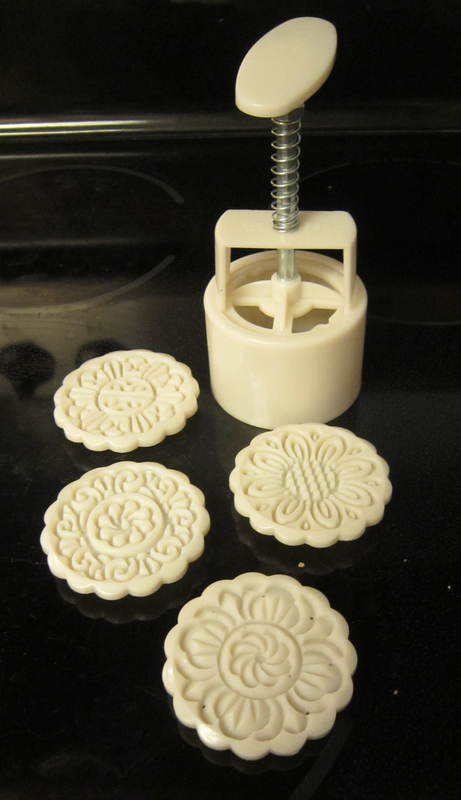 I floured the molds before stamping them. But because this is not the best process, I ended up getting blueberry in the mold and changed out the design to a clean design more often than I might have. I oiled the baking sheets before pressing the molds. I ended up with four practice mooncakes the first day and eight real mooncakes the second day. I have more filling, but I ran out of pie dough and haven’t been inspired to buy or make more pie dough just to make five more mooncakes. I pre-heated the oven to 350° F. I didn’t know how long to bake, but videos said to bake until golden brown, so I set a timer for 10 minutes and checked. After 20 minutes, I painted egg white on the tops to make them shiny and put them back in the oven. I baked the mooncakes a total of about 25 to 30 minutes (until golden brown). There is nothing about my recipe that is like the Chinese type, so the pie dough did not show the design as well as the Chinese recipes, but you can sort of see it. And you can see that I didn’t get the dough to come together as well the people who make mooncake videos on YouTube, but I’m satisfied with what came out. I didn’t spend much time perfecting the filling because I was just trying to see if I could make a pretty dry blueberry filling. In the end, I liked them. They were not very sweet but they were sweet enough. For traditional mooncakes, you are supposed to let them sit for 3 or 4 days to soften up. They taste a lot like Blueberry PopTarts, but they are really mooncakes. This entry was posted in Asian culture, Mid-Autumn Moon Festival and tagged Asian culture, Chinese Moon Festival, Make Your Own, mid-autumn moon festival, mooncakes. Bookmark the permalink.